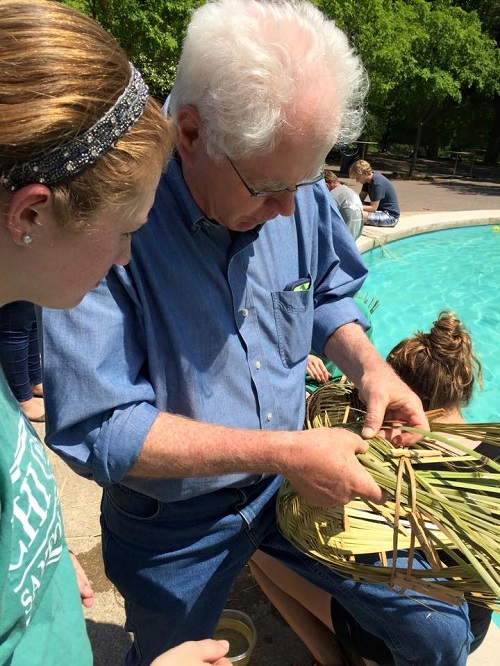 "So you have to...build a Cherokee-style basket from scratch - identify river cane, cut your river cane, split your river cane, make your strips of river cane, dye your river cane, pick out your pattern, learn to weave the basket." JIM BROWN: I came down in December of 1970 with my wife. Came down, to, was from Central East Tennessee. Hit the floodplain across Decatur and Athens, we thought well that was too flat, too much sky, we can't live down here and then we got, as we came toward Cullman, that Appalachian ridge, "Well maybe we can do this sort of thing" so interviewed and accepted and moved down here in June 1971. I was into this cultural nationalism behind European, modern European national experiences and I'm discovering Alabama. You know, I'd come to Alabama scared to death of George Wallace and I got to know Alabama kind of below the level of state politics. I got out in the countryside. My first full year would have been January of '72 and I was just so busy with creating courses I didn't do it, but the very second Jan Term, I offered Grimms to Hitler sort of presentation on, kind of, the course morphed over the years, kind of a regular sequence every two or three years: a third orature, a third a material folk culture, a third folk music and each of them with an experiential, hands-on learning to do, paired up with the lecture. If you just are saying something to somebody and they're listening to it, that's a very passive sort of education but if you can actually experience, do something to experience it in an activity to experience it, it would set that education and bring it alive much more than anything else. You had orature, or you know, oral folk literature, or more precisely orature. You have to memorize some child ballad. Do an oral history with someone generations older than you, hopefully in the family, hopefully from a more rural time. It’s getting harder and harder to do with this generation. We're more and more removed from the mass rural roots. In terms of material folk culture, you know, we're reading about the survival of the bark canoe, we're reading about the cane basket, or the Indian basketry, the Cherokee women who tried to hold their disintegrating culture together with basketry, but, so you have to make, build a Cherokee-style basket from scratch, identify river cane , cut your river cane, split your river cane, make your strips of river cane, dye your river cane, pick out your pattern, learn to weave the basket. We'll go watch some Indian basket makers do this, over at Choctaw, Mississippi or maybe up in Cherokee, depending on the year we did this. Do it yourself. Watch the unfolding character spring, draw every week, draw, start out with a tulip poplar bud, draw that bud, watch it color up, every year, watch it start to open, little folded leaves that kind of spin around, watch 5 or 7 leaves and then here comes the bloom and then think about, go down the river and let’s, when the poplar tree’s in bloom, when the tulip poplar's in full bloom, let's go down to the river and see if the red horse are on the bed because that's the old folkway, that's the old folk calendar for doing it, so become conscious of the natural world around you and what that does, in that course more than any other course I teach, it makes for an intense learning environment. The student is much more motivated and I think the education is more lasting.